Has it really been ten years since the release of The Dark Knight!? I never would’ve thought that Christopher Nolan‘s superhero sequel would prove to be one of the most highly regarded films of the 21st Century, forever sealing its fate in film history. Let’s take a look back at this film that surprised everyone and is the high-bar set by The DC Universe, something that Marvel Studios has yet to match. Summer is all about fun, warm weather and seeing some of the biggest movies of the year. One film that will always stick out will be The Dark Knight, the most definitive Batman movie ever made and featuring an unforgettable performance from the late Heath Ledger as The Joker. Director Christopher Nolan brings us a gritty experience that feels like anything else but a superhero movie and more like a dark crime thriller. Being ten years old, The Dark Knight will forever live in infamy in ways that no one could have predicted. Throwing aside all the goofy gadgets and silliness of those Batman movies from the ’90s, Nolan and his team bring a realistic version of Batman while The Joker is making his reign of terror in the well-known city of Gotham (or Chicago, where it was filmed). From the opening bank robbery scene, to the chase in the S.W.A.T. Truck and the ending that made everyone rise with cheers and applause; The Dark Knight was the summer movie that exceeded all expectations and left us breathless in the end. The real star of the show is Heath Ledger as The Joker, a completely different version than we’d ever seen before, even surpassing the performance of Jack Nicholson in Tim Burton’s 1989 Batman. Tragically, Ledger passed away prior to the film’s release and suffered from nightmares that ensued from the performance, which was a truly haunting one. It’s the reason I saw the film in the first place, to honor his memory and see what he contributed to the iconic character. Over the years, I heard about the high honors of The Dark Knight and never saw it as truly amazing as it was. The more I watched it, the more I came to appreciate it, and now I watch it about two-three times a year. Not only is the movie great but also features an outstanding soundtrack by Hans Zimmer and James Newton Howard. I’ve always felt that a soundtrack paints a picture to a film, and these two men completely outdid themselves and delivered something exceptional. What makes The Dark Knight phenomenal is the complex and well-written script, great performances from the entire cast and it’s incredible pace, even at its long runtime. Batman, as a character, is a detective, although not officially, and we get to see some of that in this film; especially when The Joker starts targeting high ranking officials after a meeting with notable crime figures. The Joker, on the surface, looks to be simple. He knows what he’s capable of and will follow through, but he’s not your typical villain. He has more on his mind. Items of desire are of non-importance to him, except for his suit maybe. Money, guns and anything else mean nothing to him. You can’t reason with him or threaten him with anything, and this one thing makes him extremely dangerous. Take, for example, the bank robbery in the beginning. He arranges a small group to rob the bank and orders them to murder each member after their specific task is done. Once it’s The Joker and one man left, he shoots him with little concern or hesitation. The moment when Batman finally meets The Joker face-to-face is another great moment of understanding his character. The Joker gets assaulted and laughs simply stating, “You have nothing. Nothing to threaten me with.” It’s chilling and if you analyze it further, it makes him a psychopath. He burns his money, kills with impunity, all the while smiling while doing so. It’s clear enough to know that The Dark Knight is not for young children, as The Joker would more than likely scare the youngsters. What surprised me most about The Dark Knight is its execution. Christopher Nolan and his brother Jonathan co-wrote the script together and crafted a very different take on Batman, a character we grew up with when we were kids. Adam West was the one I grew up watching from the ’60s and Michael Keaton appearing in the 1989 film. Christian Bale does great work here as well and is a great choice for Bruce Wayne (Batman) for the new generation of movie-goers. The supporting cast is also a highlight in and of itself. Gary Oldman as Commissioner Gordon is one of my favorite characters in the film. Aaron Eckhart portrays Harvey Dent, an ambitious lawyer who may have just bitten off more than he can chew when The Joker comes into play. In fact, the reason for his casting was when Christopher Nolan saw him in a great movie called Thank You For Smoking and thought he would be the perfect choice. When the moment is right, he becomes a flashy character but not in the sense of amazement. It’s scary and memorable at the same time. Rachel Dawes looks a bit different as portrayed by Maggie Gyllenhaal and I think is an upgrade from Katie Holmes who portrayed that character in Batman Begins. There are so many great moments in The Dark Knight that it’s hard to just watch one part, you’ll end up watching the whole movie. One thing that is cleverly done is that the villains aren’t over-used, they have just enough screen time to make them memorable in each way. No character seems to overshadow another, and Nolan directs with sheer perfection. The only part which I felt that could’ve been cut down was the boat bomb sequence where the civilians and prisoners are tested to see if they will kill each other in order to survive when a threat is presented. That part is one that I can skip over and is a bit dragged out. It’s here that we honor the legacy of The Dark Knight, a movie that will blow you away. It separates itself from other superhero films in ways that I could’ve never foreseen. The Joker is stunningly terrifying and is now one of the most memorable villains of the twenty-first century, if not all time. Heath Ledger deserved the Oscar he was posthumously awarded — the last being James Dean in 1952. His family accepted the award, and yet it brings us great sadness to know that he never lived to see a creation that only he and the filmmakers designed. 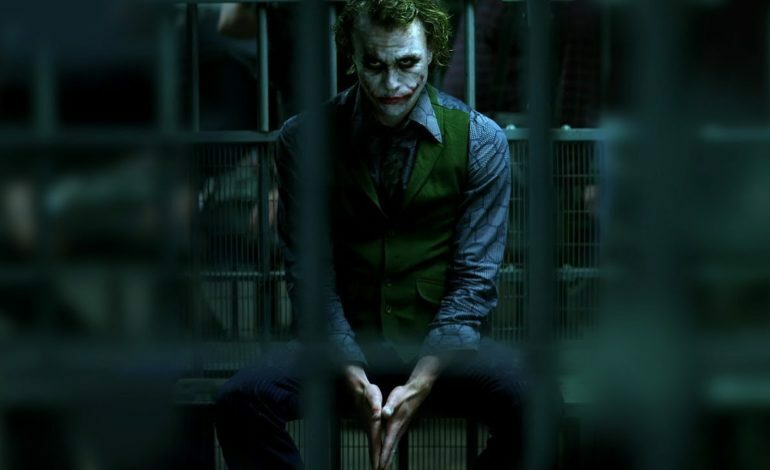 Ledger gave us a Joker that no one, I believe, can ever top. It’s something that we’ve never seen done before, and we remember him every time we watch The Dark Knight. It’s been a decade since we lost Heath Ledger, and since The Dark Knight hit theaters and gave audiences more than they could’ve ever expected. Christopher Nolan is a good director and story-teller, although he doesn’t make my personal list of Best Directors, he sure made a truly outstanding film that feels sort of like The Departed and nothing like a typical superhero movie. It’s one that will stand the test of time for generations and probably be regarded as “The Best Batman and DC Comics film ever made.” The Dark Knight features everything you can enjoy in a movie; a great story, one great villain, an awesome supporting cast, and a soundtrack that ties everything together to make a truly great feature. Forget everything you think you know of superhero films because The Dark Knight is unlike any one of them!